After viewing multiple surveillance videos of patrons falling off stools, being overserved, urinating in public, getting groped, and laid out on the sidewalk by the front door after closing time, the Licensing Commission last week suspended the Chelsea Walk Pub’s liquor license for 10 weeks. The attorney for the Pub argued that the Broadway bar has avoided violations in the past. But for Commission members, the multiple incidents brought before it at its April 3 meeting were serious enough to warrant the harsh judgment. The Licensing Commission found the Chelsea Walk Pub violated City ordinances by overserving patrons, selling liquor to an intoxicated person, creating a noise or disorderly disturbance, and failing to provide video surveillance. The majority of the violations resulted from incidents responded to by the Police Department late last November. In a letter to the Licensing Commission, City Manager Thomas Ambrosino urged the commission not to take the reported violations lightly. “A liquor license is a privilege and not a right,” the City Manager stated. The majority of the April 3 hearing revolved around the showing of video surveillance footage from a number of the incidents. Police highlighted one patron at the end of the bar who had three drinks in front of him before stashing an unopened beer in his jacket while the bartender wasn’t looking. Police Captain Keith Houghton said both incidents violated the city alcohol serving ordinances. Attorney Jeffrey Rosario Turco, representing the Pub, put up a defense to the evidence, noting several times that the patrons who were alleged to have been overserved seemed steady on their feet and not intoxicated. Additional video and evidence showed a patron leaving the bar and urinating outside on the sidewalk and a patron weaving into the street before being spotted by a police officer. Licensing Commission member Roseann Bongiovanni was unmoved by Turco’s “not swaying” defense when it came to video of one patron who left the bar then went back in after being allegedly overserved. Most damning was an incident that showed several patrons and a bartender struggling for nearly 10 minutes to carry an alleged intoxicated patron out the door after closing time. Once the man was laid on the sidewalk, the bartender went back inside and locked the front door of the bar. “The bartender quickly closed the door and leaves him out flat, leaving him pretty much to us,” said Houghton. Turco did not dispute the evidence in that incident, but said that the bartender in the video had been fired. Chelsea Walk Pub owner Angela Palmieri said the main problem has been that her staff has not stepped up. “They don’t listen to what I tell them to do,” she said. While the Pub hasn’t come before the Licensing Commission in recent memory for violation, Bongiovanni said it has largely been because there weren’t City resources to police the establishment before. She said the Chelsea Walk Pub has a long history of shenanigans. In addition to the 10-week liquor license suspension, the Licensing Commission also voted to reduce the bar’s operating hours from 8 a.m. to 1 a.m. to noon to 10 p.m. If one is looking to hit the local bars this Cinco de Mayo, the options are going to be a little more limited than usual. At its March 7 meeting, the Licensing Commission disciplined two local restaurants for a variety of infractions that will result in them losing their liquor licenses for the Cinco de Mayo weekend on May 4 and 5. (The restaurant Cinco de Mayo in Chelsea was not disciplined or called to the Commission). In addition to losing its liquor license for that weekend, the Commission voted to roll back Acapulco’s hours of operation indefinitely, forcing the Fifth Street establishment to close at 11 p.m. instead of 1 a.m. The Acapulco punishment stems from an incident last November when a security worker at the restaurant struck a customer over the head with a police baton. The Commission also enforced an hours rollback from 1 a.m. to 11 p.m. – along with the weekend suspension – for Bar La Cueva at 802 Broadway. That punishment was enforced for an incident where several patrons were overserved, as well as for past concerns about noise and unruly patrons at the bar. In addition, Commission member James Guido requested a hearing next month to consider revoking Bar La Cueva’s entertainment licenses. The attorney for Acapulco said the issue at his client’s establishment is systemic of a larger issue in the city, where security at bars is handled by companies that act almost as paramilitary or law enforcement agencies. Several commissioners agreed that there is a larger issue that needs to be addressed in the city with bar and liquor establishment security, but noted that Acapulco deserved a more forceful discipline than simply firing its current security contractor. “You say security is a problem, but you’ve had the same company for a decade,” Commissioner Roseann Bongiovanni said. The issues at Bar La Cueva seemed to extend beyond the recent incident where two people were overserved, as several commissioners noted that there have been noise and unruly patron complaints at the bar for years. John Dodge, the attorney representing the bar, said for the incident in question, his clients acted responsibly and asked the patrons who appeared to be intoxicated to leave. But Bongiovanni noted that the bar has been a problem in the past, including racking up a 14-day liquor license suspension about two years ago. “They have been a complete nuisance and annoyance to the neighborhood; you can roll your eyes all you want, counselor,” she said to Dodge. Both the bars got off relatively easy compared to Fine Mart, a liquor and convenience store at 260 Broadway. The Commission suspended the store’s liquor license for a total of six weeks for three offenses, including an incident where an employee struck a woman who was intoxicated in the store, for selling nips after the enactment of the City’s nip ban, and for the sale of alcohol to a minor. City Manager Tom Ambrosino, an ardent supporter of the City’s ban on 50 ml bottles of alcohol, said there needs to be consequences for businesses that violate the ordinance. 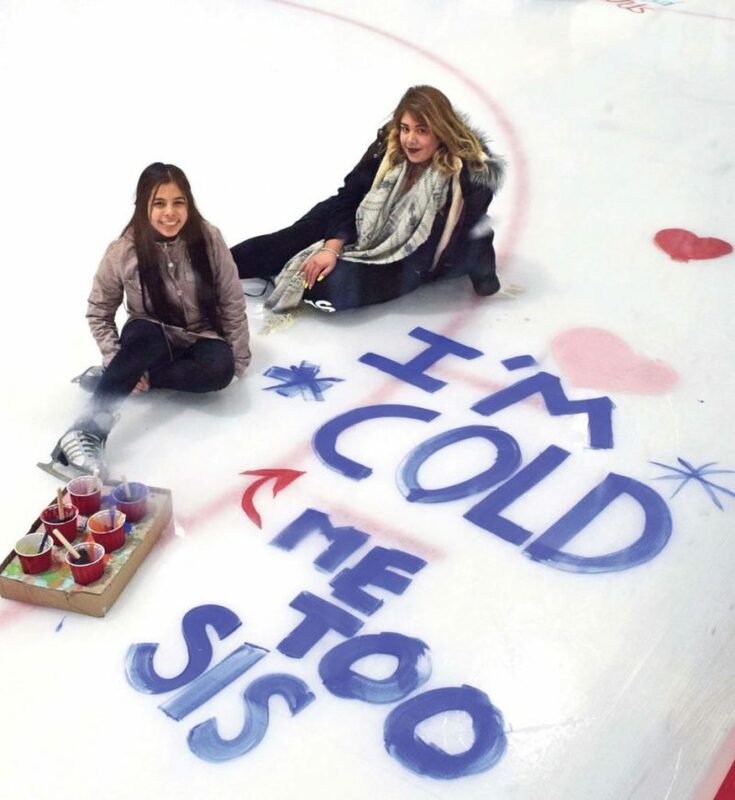 Andrea Lopez and Elida Flores got a kick out of being cold on Saturday night, Feb. 9, at the Cronin Ice Rink. Scores of teens showed up for the first-ever Chelsea Youth Commission Skate Party at the Rink. The Licensing Commission has continued a hearing on special additional rules for marijuana establishments to its March meeting. The commission opened the public hearing at its meeting on Thursday, Jan. 17. While the hearing did not generate much controversy, commissioners did agree that they wanted more time to consider several issues, including language limiting where retail marijuana shops can be concentrated, and the amount the city will charge for application fees. “I’d like to see more research and see what nearby cities have done and what their challenges are,” said commission member Roseann Bongiovanni. Currently, there are three applications in the works for retail marijuana shops in the city. The city will allow a maximum of four retail licenses. According to the proposed regulation, the Licensing Commission will not issue a license to anyone who has violated Licensing Commission rules and regulations in the past five years. All licenses are subject to zoning approval and state Cannabis Control Commission approval. The operating hours for retail shops will be limited to 9 a.m. to 9 p.m., and all signage will have to be approved by the city, according to City Solicitor Cheryl Watson Fisher. “We are trying to be a little more restrictive now so we don’t have to clean up after the fact, like with liquor licenses,” said Fisher. The section of the proposed regulations that garnered the most discussion among commission members was one which would limit the concentration of where retail marijuana shops can be located. Fisher noted that the language included in the draft regulations, limiting retail shops to one per voting district and not within 500 feet of another retail marijuana store, was not included by the legal department. She said it was included because it was a request made during a past public hearing on marijuana regulations. The city will allow marijuana establishments in the Industrial, Shopping Center, and Business Highway zone. Licensing Commission Chairman Mark Rossi said he’d like the commission to have more discretion over where facilities can be located. “Our job is to factor in the input from the community and the licensees,” said Rossi. Much like it does with liquor licenses, Rossi said the Licensing Commission will be getting input from the community, police and fire departments, and other city officials when it comes to making a final determination on issuing a marijuana license. “This committee is uniquely situated to make that determination,” he said. Commission member James Guido said he would like more information on limiting concentration in voting districts before making a final decision on the proposed regulation. Rossi also said he had questions about the $5,000 application and annual renewal fee for marijuana establishments, stating he would like to see a higher number. Rossi said the application fees and concentration of locations will be discussed when the hearing is continued at its March 7 meeting. “This is a big issue that affects everyone,” he said. •In other business, the Licensing Commission adjusted its penalty for Rincon Latinos restaurant at 373 Washington Ave. In December, the commission suspended the restaurant’s liquor license for eight days spread over four weekends for repeated instances of exceeding its capacity. Last week, the commission agreed to suspend the license for two weekends in January, as well as for a five-day stretch during the week when a new handicap bathroom will be installed by the restaurant owners. The new bathroom will allow Rincons Latinos to increase its capacity from 17 to 28 people, according to John Dodge, the attorney representing the owners. Rincons Latinos Restaurant on Washington Avenue has been no stranger to appearing before the Licensing Commission over the past several months. At the Thursday, Dec. 6 meeting, it was a case of enough was enough for the licensing commissioners, as they voted to suspend the 373 Washington Ave. restaurant’s liquor license for eight days. The suspension, largely leveled for repeated instances of exceeding the posted capacity of the establishment, will be served during four weekends over December and January. A police inspection in October found 42 people in the restaurant, well above the posted occupancy limit of 17. Police officials also claimed there was missing signage and insufficient lighting in the restaurant. Attorney John Dodge, representing Orlando Pineda of Rincons Latinos, argued that his client is planning to install a second handicap accessible bathroom in the restaurant. That move would double the occupancy limit of Rincons Latinos from 17 to 34, he said. “It’s just breaking the law and not following rules,” countered Mark Rossi, the Licensing Commission chairman. Dodge said Pineda is doing his best to run a business and will spend upwards of $7,500 to install the new bathroom to comply with regulations. “Mr. Pineda has put his life and soul into the place, and he lives right upstairs,” Dodge said. Dodge also noted that the police withdrew a previous charge against the restaurant from the fall that people were illegally bringing cases of beer into and out of the restaurant. Commission member James Guido took exception to Dodge’s accusation of unfairness. Commission member and Inspectional Services Director Mike McAteer said he has been dealing with the occupancy issue and plans for an additional bathroom since July with no movement on the issue from the Pinedas. Rossi said Dodge was basically taking a “no harm, no foul” approach to the occupancy violations and that the Pinedas have not made enough effort to address them over the past six months. The commission members batted around several possible punishments, from a 30-day license suspension to outright revocation, before deciding on the eight-day suspension meted out over four weekends. Rossi said if the establishment violates the 17-person occupancy limit before approval for expanding to 34 people, it will be subject to license revocation proceedings. In other business, the commission took its annual vote to allow extended New Year’s Eve hours to 2 a.m. The commission also approved giving a six-month extension to Samir, Inc. to find a new location to use a wine and malt beverage license. It’s the case of the cases of Corona going in and out of Rincon Latino Restaurant. Following a histrionic licensing commission hearing on Tuesday, Sept. 25 that saw the lawyer for the restaurant’s owners compare the proceedings to those in Russia and referred to the hearing to “a lynching,” the commission continued the hearing until its next meeting next month. As the last hearing on a busy commission agenda, everything started calmly enough, as the commission heard a police report from officer Augustus Cassuci detailing two incidents he witnessed just outside the Washington Avenue Restaurant on June 22 and 23. The officer stated that on Friday, June 22, he was passing by 373 Washington Avenue when he saw about 10 people crossing the street, with one carrying a case of Corona beer. The next day, Cassuci said he saw a customer carrying a case of Corona into the restaurant. Where the hearing raised the ire of attorney John Dodge, who was representing the restaurant, was when Cassuci raised a number of issues at Rincon Latino Restaurant that were not included in the two-paragraph police report. Additionally, police Captain Keith Houghton said the restaurant often appears to surpass its occupancy limit of 17 customers and the curtains of the establishment have been closed, in violation of the law. Police officials also showed the commission a photo taken from the restaurant’s security camera that they said showed the establishment as being over capacity. “How am I supposed to represent (the restaurant) when all I have is a two-paragraph police report?” asked Dodge, who asked that the hearing be continued to the commission’s next meeting since evidence was introduced that he had not previously seen. Dodge said the allegations leveled by the police had nothing to do with the original report of customers taking out or bringing in cases of beer. Licensing Commission Chairman James Guido said a public hearing does not follow the same process as a court hearing and that the information being provided during the hearing was due process. “Maybe due process in Russia, in America we are given the evidence before a hearing,” said Dodge. Commission member Roseann Bongiovanni asked for calm, and suggested the commission continue the hearing for one month. The commission approved the continuance, as well as a request that the restaurant provide video of peak hours during the past several weekends to help determine if there has been overcrowding or other issues at the restaurant. Facing many critics from the public that showed up to speak against two-way Broadway, the City Council on Monday decided to defer any vote and, instead, hold a Committee on Conference to review the matter. In August, the Traffic Commission voted 5-1 to approve the two-way plan, as well as a spate of many other non-controversial changes to Fay Square, Chelsea Square, Bellingham Square and City Hall Avenue. Council President Damali Vidot called for the committee, and the Council approved the move. She said they had until Oct. 6 to hold the meeting and to have a vote of the full Council. The City Council must approve all actions of the Traffic Commission, but if they do not do so by Oct. 6, the Commission’s approval will become law. Many on the Council have not made their opinions known yet, but some have, and ultimately the fate of two-way Broadway will fall on the votes of 11 members of the Council. Council President Vidot has been critical of the idea, and has particularly disagreed with the planning process that has unfolded over the past two years. In the past, she has been against the change. Councillor Leo Robinson, however, said this week he is in favor of two-way Broadway. “I’m a two-way Broadway guy,” he said. Councillor Joe Perlatonda has also spoke in favor of the plan, and said the one-way plan is dangerous because it calls for cars to park outside of the protected bike lane. He said that would leave those exiting their cars in a dangerous position with oncoming traffic and with oncoming bicyclists. Meanwhile, Councillor Bob Bishop said he doesn’t buy the idea of two-way Broadway. To this point, he said he isn’t convinced it’s a good change. City Manager Tom Ambrosino and Chief Brian Kyes are some of the biggest advocates, and though they don’t have a vote, they have strongly called for the change for months. Resident Sharleen McLain, however, was one of several residents who said the plan is flawed and has been forced upon the public. Ambrosino said he is in favor of the two-way plan, but he implored the Council to consider the plan is much more than just the two-way Broadway situation. He said there are many, many more non-controversial changes in the package that people do want universally. The Council will meet next on Monday, Sept. 24, and the Conference Committee will likely take place next week. One can raise a six-pack to the end of summer if they’re a legal-aged hardworking resident, but one will no longer be able to raise up a 250ml nip bottle due to a continuing voluntary ban by Chelsea liquor stores courtesy of the Chelsea License Commission. The Chelsea Licensing commission met again on the topic of 250 mL alcohol bottles on Aug. 28 in the Chelsea Public Library to packed room of invested residents, owners, commissioners, and police. They were all there to address the contentious topic of permanently banning 100ml to 250ml bottles and single can/malt bottle beverages. Following from the initial commission decision to employ a voluntary ban on the June 26, the rare Aug. 28 meeting was an update to see about further action. Over the summer downtown stores stopped selling nips and voluntarily stopped selling other small bottles as well as two very low-cost liquor brands identified as problematic. The meeting ended with the resulting community agreeing to maintain a voluntary ban of 100ml and 250ml bottles and new, agreed-upon stipulations for community liquor store owners. The agreement comes on the heels of escalating community tensions with what Chelsea Police have described as “50 or so” individuals who constantly perpetrate public intoxication and littering problems for Chelsea community residents and visitors. “I can tell you [increasing nip littering] has definitely decreased,” said Chelsea Police Capt. Keith Houghton. The Chelsea Police Department seemed confident in the immediate results they have witnessed in the following weeks of the proposed ban. However when questioned by License Chair Michael Rossi if the results could be quantified, the police shifted focus and explained they now require a three-hour alcohol safety course. “I find it really hard to believe there have been no incidents of drunkenness [since the voluntary ban],” stated commission member Roseann Bongiovanni with open skepticism. Bongiovanni wasn’t the only person in attendance that openly questioned the Police Department’s results and the lasting impression of the ban thus far. Robert Mellion, executive director of the Massachusetts Package Store Association, also made his case in the two minutes allotted for public hearings. Multiple residents and store owners echoed Mellion’s sentiment, agreeing that a legal ban instead of a voluntary ban infringed upon the rights of residents to legally purchase alcohol and would not begin to fully cover the larger issue at hand, alcoholism. The general sentiment being that there was nothing to stop these individuals from getting the same banned 250 ml bottles from liquor stores in neighboring cities and towns. Mellion addressed those in attendance by listing the critical steps the License Commission, store owners, and police department should collaborate on together. Accomplishing cooperation by employing a voluntary ban of 100ml bottles, establishing a alcohol beverage training course and certification for liquor store owners, maintaining a do not sell list for specific individuals, along with impeding sales to intoxicated buyers. It was agreed by the Commission to maintain a voluntary ban instead of a permanent one, keying in on public sentiment to not overextend their legal rights over Chelsea residents’ ability to purchase alcohol and promote community agreement and turnout to these meetings. The training course has already been attended by all 12 local liquor stores, of which 25 individuals from these stores achieved the needed passing score of 75 or better. The Police Department also stated that seven individuals scored a 100. The voluntary ban itself has not been enough to assuage some residents’ concerns, though. Edon Coimbra, owner of Ciao! Pizza and Pasta, was not content with the decision to tackle part of what he sees as the bigger problem. The Comission had no response for a full blown initiative in tackling persistent alcoholism in Chelsea, and the voluntary ban will have to be measured through quantitative metrics that Rossi and Bongiovanni both identified a need for. Alcoholism remains the bigger problem to many local residents like Coimbra who must deal with intoxicated individuals loitering near his restaurant on a daily basis, leaving his restaurant and other areas reliant on police assistance for these incidents. The Commission will take up the issue again in three months.